There is so much to love about the Oakley Crossbody Bag by Mona B. First, it has a soft, broken-in feel to it, due to its construction of upcycled canvas. Measuring 10" x 7.5" x 3", the Oakley is the perfect size for a crossbody bag for comfortable wear and ease-of-use. 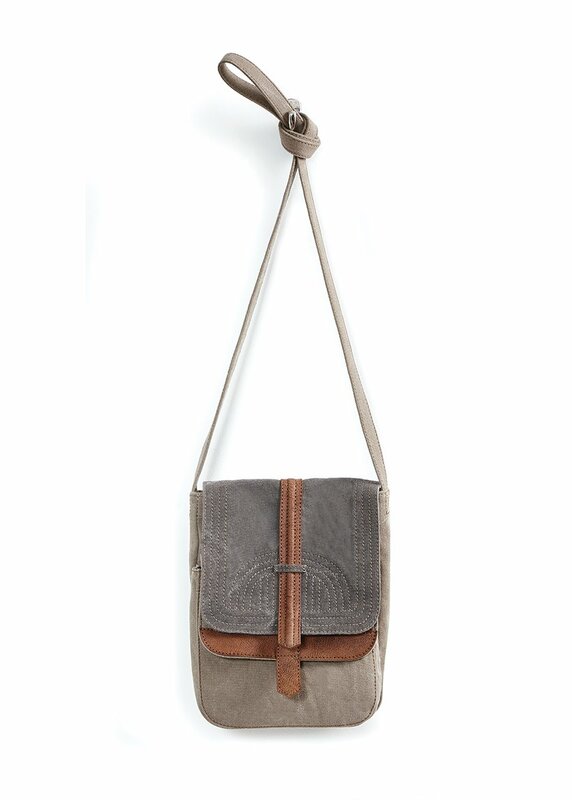 Neutral canvas colors (tan and grey) are combined with brown leather accents for a great look that will go with everything. Open the top flap with magnetic closure to access the inside to find room for wallet and other necessities, as well as an open pocket and a zipped pocket. The interior is lined with the signature Mona B. cotton lining. Underneath the main flap, find another flap with magnetic closure with a cotton-lined pocket suitable for holding a phone. Either flap may be accessed with ease; you may open either one without opening the other. The top flap features attractive stitching detail. Crossbody strap has 25" drop. Made from up-cycled canvas and genuine leather. The fabric shows the history of its travels which may include stitch marks, minor staining and unique scars and bruises. Color variations and patches add to the uniqueness of each bag. Heavy cotton canvas.